It's easy to go green this Earth Day: just head out to your favorite beach on Saturday and join your friends and neighbors in the Earth Day Beach Clean-Up. Meet up at 10:00 am with our volunteers, who will be there with everything you need to get started. Afterward, join us at the Oak Bluffs Sailing Camp Park for great food, a free raffle, and to compare your treasure hunting stories. There will be plenty of soups, salad, pizza, and other treats - no hardworking beach cleaner should go without some refreshments! At the after-party, make sure to keep your eyes and ears open for lots of prizes and fun activities. This year we will have two ongoing raffles, one for adults and one for kids. Another bonus comes courtesy of the MV Shellfish Group, who are holding their fundraiser extravaganza later that night. Show your selfie from the Beach Clean-Up at the door and get $5 off admission to the event. Finally, many thanks to Coral Shockey from Featherstone Center for the Arts, who will share fun arts and crafts activities with kids of all ages. In the spirit of reducing waste and pollution before it even gets to the beaches in the first place, the party will be a Zero Waste event. We will have real dishes, mugs, etc, but still make sure to bring your reusable water bottle with you! Local organizations returning this year to work at designated beaches include the MV Bank, Lagoon Pond Association, Friends of Sengekontacket, Island Spirit Kayak, Wampanoag Tribe of Aquinnah, Tisbury Waterways Inc., MV Surfcasters Association, Sheriff’s Meadow Foundation, The Church of Latter Day Saints, MV Striped Bass and Bluefish Derby, Felix Neck, the O.B. Conservation Commission, and our local troops of Junior Girl Scouts, Brownies, Cub Scouts, and Boy Scouts. In addition to our regular set of beaches, Chilmark Shellfish Constable Isaiah Scheffer will be taking adventurous volunteers on his boat to clean around Menemsha Pond; if you'd like to join in, please meet up at the Texaco station at 10 am. Thanks to our sponsors: The Black Dog, Rocco’s, Scottish Bakehouse, and Friends of Sengekontacket for their delicious donations to the after-party spread, and MV Bank for advertising support. Once again, MVY Radio will be broadcasting live from Eastville Beach during the clean-up. Finally, special thanks to the DPW’s from Tisbury, Oak Bluffs, and Edgartown, the MV Refuse District and Bruno’s for taking care of all the beach trash! VCS aims to promote the idea that “Earth Day is Every Day” through this morning of fun and environmental service. With the help of many individuals and organizations working together, we can take responsibility for our Island’s beaches and do our part to protect the planet's oceans, our most precious local, and global, resources. Check out the photos from the 2018 Earth Day Beach Clean-Up! There was a lot of energy and excitement around the nation and the world leading up to the first Earth Day, 43 years ago. Here on the Island, the newly fledged VCS was looking for a project that would make a splash – ideally, one that would also have a long-term impact. Recycling was a new concept, and seemed like a good one to promote on this special day. If my memory serves me, the Town of West Tisbury had already made a commitment to recycling by building concrete bins at “The Dump.” Some of us still call it “the dump,” and in those days it was just that, an open pit into which everything, including the proverbial kitchen sink would be tossed. Once, a lovely Victorian bathroom sink was carefully placed at the brink of the pit by someone who hoped it would be “recycled,” and it has graced our home ever since! So, the plan for Earth Day was to have a couple of dozen high school students pull my giant ox cart from Owen Park in Vineyard Haven to Edgartown, via the State Beach in Oak Bluffs, and collect as much roadside litter as possible. The recyclable items (mostly beverage bottles and cans) would be separated from the trash and trucked to the new West Tisbury bins. It was a beautiful April day, cool and clear, with the air filled with kids’ laughter and the rumble of the iron-shot wheels. The students were full of energy and committed to make a difference. They pulled the cumbersome cart for hours and filled it several times with bottles, cans, and trash from the roadside. Every time it was filled, a pickup would back up to it, make the transfer, and race off the dump. We didn’t quite make it to downtown Edgartown, but we got as far as Trapp’s Pond on the south end of the State Beach by sunset. We must have collected a ton of glass and metal. And so was born a new concept of what is “trash” and what is a “resource” on this island, with its limited space for waste of any kind. Most important of all, a new generation of Islanders learned how to make a lasting, positive impact on their environment. 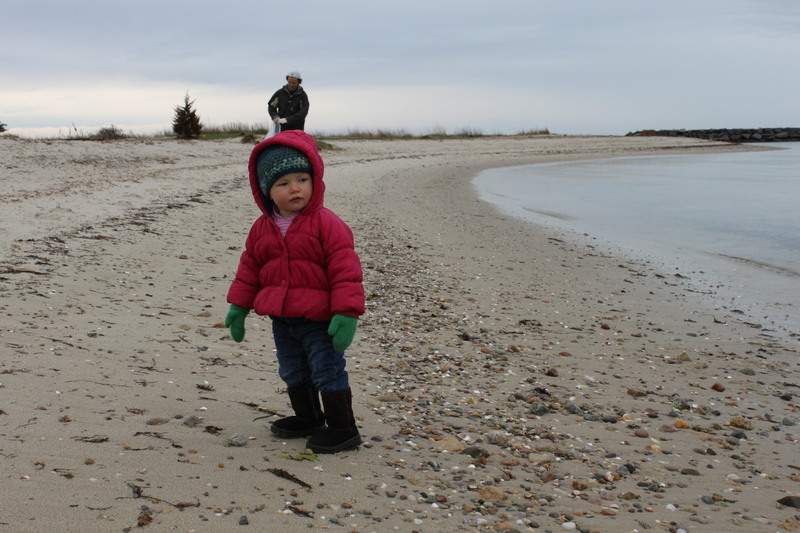 Though the first known Martha’s Vineyard Earth Day Beach Clean-up was conducted in 1970, the continuous string of annual clean-ups began in the early 1990s, following the 20th anniversary of the original Earth Day. In an effort to re-kindle the interest and enthusiasm from the Earth Day 20th Anniversary Fair at the MV Regional High School in 1990, I decided to organize the first Island-wide Earth Day Beach Clean-up in 1992, cleaning ten of our Island’s beaches with the help of many volunteers. VCS was an important sponsor, as were the Martha’s Vineyard Savings (nee Co-operative) Bank, Martha’s Vineyard Surfcasters Association, the Lagoon Pond Association, and the Martha’s Vineyard League of Women Voters. The next year, VCS took ownership of the event as the primary sponsor. I continued to organize the beach clean-up on their behalf until 2004, at which time VCS took on management duties. VCS continued the expansion of the event’s reach and community participation, culminating in this year’s anniversary. Over these twenty years the clean-up has grown in volunteer participation, organizational strength, number of beaches, and sheer volume of garbage collected. While the event has grown and changed considerably over the years, the support of several organizations and individuals has been of such long duration as to warrant special mention: The Lagoon Pond Assn. and Margaret Curtin, MV Surfcasters and Tom Robinson, former VCS board member Bob Berry, the Wampanoag Tribe of Gay Head (Aquinnah), the Unitarian Universalist Church and Janet Holladay, the MV Savings Bank, Friends of Sengekontacket, Chuck Ratté, the MV League of Women Voters and Mary Miller, the Great Pond Foundation, Island Paddle Tours, the Girl Scout Juniors and Tammy Perry, and many other scout groups, including Brownie Troops 523 and 779, Cub Scout Packs 90 and 93 and Den 4, Chilmark Girl Scouts, and Daisy Troop 129. The most common items found are bottles and cans, balloons, other small plastics, fishing gear and lobster traps, rope and nautical jetsam, cigarettes, scrap metal, polystyrene foam, and wood debris. Taken together, the various types of plastics make up the vast majority of garbage collected. Among all that plastic, one particular item is possibly the most aggravating regular find at the Clean-Up: the escaped balloon. But over the years, we've also found a pickup truck tailgate, a boat seat, other car and boat parts, an oven, a lawnmower, a big-screen TV, medical waste, and sewage treatment discs. And then, there's this one . . .
Perhaps the most unusual find during the twenty years of Earth Day beach clean-ups involved VCS board member Penny Uhlendorf, her son Karl, and our Executive Director Brendan O’Neill. In April of 1997, Brendan and his wife Linsey Lee discovered a test tube on the beach near Lake Tashmoo in Tisbury. Inside was a message with a name and address, to which Penny responded promptly on behalf of VCS. A reply was received from Jon Skillman, a student in a Marine Biology class at Newton North High School. Jon had released the test tube from the Woods Hole ferry into Vineyard Sound as part of his experiment to plot patterns in the currents around Martha’s Vineyard. Some 2,000 test tubes were released, and over the course of weeks he received responses from about 350 people who had found his experimental tubes. The most unusual response I received was from someone who claimed to have found a test tube in the Detroit River in Michigan. Until your letter arrived, that is. What is unusual about your letter is that my experiment was conducted in 1973, and this is the first response in well over 20 years. By the way, I distinctly remember getting a response from a young boy named Karl Uhlendorf. Is he possibly a relation? Penny’s son Karl did indeed discover one of those test tube messages. Today, Karl is 43 years old and walks the same beaches with his 5 year old son Charlie and 2 year old son Henry. Cleaning up our planet’s five great garbage patches – incomprehensibly massive collections of plastic formed by large-scale ocean currents – is a popular goal for obvious reasons: they’re deadly to sea life, costly to shipping, and generally represent a disgusting reminder of the waste that inherently accompanies the convenience of plastic. However, efforts to directly clean the garbage patches face two enormous problems. First, removing the plastic from these great oceanic vortexes (or gyres) has proven technologically difficult (many would argue impossible). The various creative techno-fixes proposed have all lacked for practical effectiveness, and some have not even been based on sound science. But we know that without some brilliant new technology, no amount of volunteers with pool skimmers are capable of handling this task: it is simply too huge. Second, even if we could somehow remove and recycle the floating debris from the ocean, there is a more intractable problem beneath the surface. The ocean is powerful enough to break the plastic bottles, bags, sheeting, etc. down into tiny particles called microplastics, but lacks the ability to fully degrade them (a chemical breakdown that requires very high temperatures). The microplastics are then easily ingested by fish and other marine animals – a recent study estimates that fish in the northern Pacific ingest between 12,000 and 24,000 tons of plastic a year. Worse, it appears that the plastic particles absorb toxic chemicals which can then move up the food chain as predators eat the fish that ate the plastic (and then the fish that ate the fish, etc.). This process, known as bioaccumulation, ultimately results in the top-level predators – many of which we eat – having the greatest levels of toxins. So where does that leave us? We could despair . . . or we could accept that we must start at the source and get to work. Don’t let so much plastic get into the ocean in the first place! For starters, Reduce, Reuse, Recycle! Locally, VCS has helped reduce the plastic in our waste-stream through our recycling program for boat shrink-wrap, and working to get recycling containers placed at the Steamship Authority terminals and on-board the vessels. Globally, new programs and regulations can help as well, though it can be an uphill battle: many cruise ships, for example, now pulp or incinerate their garbage before dumping it at sea. But most important, while the science is pessimistic about oceanic clean-ups, it brings hope to land-based efforts. About half the material in the garbage patches is spit out yearly, eventually ending up in another gyre or on a beach somewhere. Therefore, beach clean-up efforts not only reduce new inputs to the garbage patches but also chip away at what is already there. It really is possible to clean the great garbage patches, but it will be done gradually: through reduced input, collecting the material that’s spit out on beaches, and (unfortunate, but it still counts) processing through the food chain. Few among us would just leave a balloon on the beach, but what many don’t realize is that once a balloon slips the surly bonds of Earth it usually travels a very long distance. (One balloon unleashed for a science fair experiment was retrieved on an island 1,300 miles from its release site.) Certainly this is a big part of why we release huge numbers of them at graduations and other important occasions: the symbolism of freedom and the promise of travel to unknown distant places. Check out the photos from the 2018 Clean-Up! Every year, on the Monday morning following the annual Earth Day Beach Clean-Up, the staff at VCS take a deep breath and reflect on our amazing community of volunteers. After scouring a large portion of the Island’s coastline for the usual bottles and cans, bits of plastic large and small, chunks of Styrofoam, fishing gear and other marine debris, it’s time to relish in the glow of a job well done – through the combined effort of hundreds of people working together in common purpose. Fanning out over 26 beaches (including new addition Jetty Beach in O.B. ), over 250 volunteers collected an unusually large amount of trash in 2018: 3,380 pounds was collected in Tisbury alone, the Refuse District (representing the haul from Edgartown and up-Island) took in 2,880 pounds, and an unknown (but substantial) amount from Oak Bluffs added up to about four tons of waste removed from the beaches in just two hours. The high number of big, heavy items washed ashore by the series of powerful storms this March may explain the large total mass of the year’s take – one broken lobster trap easily weighs more than 100 balloons and plastic bottles combined. Some of the more unusual finds this year were an antique sewing machine cast-iron pedal, a commercial coffee pump-pot (we promise we didn’t lose it during that Winter Walk! ), and a lost pass entitling one would-have-been lucky student to a night of no homework. The hard work of planning, organizing, and finally doing the clean-up is always rewarded with the tired but happy faces of satisfied volunteers at the after-party. Held for the first time at the Sailing Camp in O.B., kids explored a natural playground of fallen trees and adults enjoyed the view of the lagoon, all while everyone’s mood was brightened by the welcome sunshine. After everyone warmed up with mugs of chili, chowder, and many other good eats (generously donated, see below), we were treated to a celebration of a recent event that will strengthen our ability to protect our beaches and oceans. Seventh grader Mya O’Neill gave a presentation on how the West Tisbury School’s student group “Safe Sea MV” won passage at four Town Meetings for their bylaw to stop the intentional release of helium balloons. Congrats! Thank you to our fiscal sponsors, Cape & Islands United Way, MV Saving Bank, and MVY Radio; to Josh Aronie, the Black Dog, Scottish Bakehouse, the FARM Institute, and IGI's Farm Hub for food donations; to Robert Lionette and our team of volunteers for running the kitchen; and to our beach group leaders, Church of Latter Day Saints, Friends of Sengekontacket, Girl Scouts, Brownies, Cub Scouts & Boy Scouts, Felix Neck, Harbor View Hotel, Lagoon Pond Association, MV Savings Bank, MV Surfcasters, MVY Radio, Oak Bluffs Con.Comm., Sail MV, Sheriff’s Meadow Foundation, Striped Bass and Bluefish Derby, Tisbury Waterways, Town of Chilmark, The Trustees, Wampanoag Tribe of Gay Head (Aquinnah), Brian & Caroline Giles, Bruce Golden, and Bill Randol. Finally a huge Thank You to every single volunteer who came out to help protect our ocean environment! Check out the photos from the clean-up! Nothing too strange turned up this year, apart from a pirate sword and some crime scene tape, but there were some interesting patterns. At Squibnocket, the most common item was not cigarette butts, but lighters – lots and lots of lighters! Down-Island, the most highbrow trash was found at Edgartown’s beach between Fuller Street and the Lighthouse: very little plastic of any kind, but many beer and wine bottles. In the 50th year of VCS, it was the 23rd annual Earth Day Beach Clean-Up. A hearty thank-you is in order to all who braved distinctly sub-optimal weather to participate in the 21st annual VCS Earth Day Beach Clean-up. Over 200 volunteers helped clean 23 Vineyard beaches, providing a great environmental service, both local and global. Our greatest Island resource got a much needed spring cleaning through the removal of truckloads of garbage, much of which would have inevitably returned to pollute the world’s oceans and threaten marine life. This year’s after-party was graciously hosted by the Harbor View Hotel and featured their own great food along with donated treats from Flatbread Co. and the Scottish Bakehouse. Thanks to them and our other major sponsors, M.V. Savings Bank, Comcast, and WMVY (who broadcast live from Eastville Beach). One volunteer deserves congratulations as well as thanks: as the winner of our Earth Day raffle, VCS member Julia Livingston of Cambridge and Edgartown will be taking home a copy of Oceans, a beautiful book/DVD /Blu-ray set by Jacques Perrin. Julia helped clean up Menemsha beach. We estimate about two tons in total was hauled away in what was nine or ten dump truck loads. As always, the most abundant items were small bits of plastic, beverage bottles and cans, and those infernal Mylar balloons, complete with their festive and wildlife-strangling ribbons. Common large items included car and boat parts, lobster traps, big pieces of Styrofoam, and lots of rope. The oddities this year (though they’re truly not that odd when viewed in the 21-year context of the event) were several deck chairs, a road sign, and large chunks of the wooden staircases that (used to) lead up to the top of the cliffs to the west of Lucy Vincent Beach. Thanks to everyone involved, from our sponsors and supporters to the volunteer groups and individual community members, for making the 20th Anniversary beach clean-up the most successful yet. Approximately 275 people came out and collected about 225 large bags of trash from 25 of our Island’s beaches. Afterwards, thanks to our very generous sponsors, including Comcast, Flatbread Co., MV Savings Bank, shirtsbyTed, Tisbury Wharf Co., and WMVY, the traditional after-party was considerably more lavish than usual, featuring free pizza and t-shirts for kids at the Tisbury Wharf. The 19th annual Earth Day Beach clean-up can now be put to rest as a complete success. Although skies were sunny, temperatures didn’t make it out of the 40's and winds in the 20's and 30's made it feel much colder. Nevertheless, hundreds of individual volunteers showed up to clean beaches of accumulated trash. The effort this year officially covered 23 beaches but many other smaller beaches were also included by people just out for the day trying to make a difference. Over 25 organizations participated as well as many individuals who served as beach coordinators. This year could perhaps best be described as the year of the “scouts” as we had extensive participation by various scout troops all over the island. VCS board members and staff served as beach coordinators, roaming photographers and trouble shooters generally trying to help out where ever possible. Other organizations such as the Trial Court Community Services Program, the Lagoon Pond Association and Tisbury Waterways, Inc. covered multiple beaches throughout the day. TWI and the various groups which they work with provide this service for many Tisbury beaches throughout the year. Many of our larger beaches and some smaller ones too reported 20 to 30 bags of trash picked up. Close to 300 bags of trash were collected. Pick-up trucks and dump trucks provided by local highway departments were filled to overflowing. The more common pieces of trash still seem to be the small liquor bottles (“nips”), beverage containers, water bottles and balloons. Certainly some of those balloons drift in from off-island but we would hope that anyone living on the island of Martha’s Vineyard would be sensitive enough to the potential impacts on marine life to avoid using balloons for advertising or celebrations and if they simply have to have them at least make sure they don’t “escape”. The involved scout troops were especially concerned about the balloons and are planning some follow-up discussions on what could be done about it. The more unusual list of items included television sets, a copy machine, propane tanks (especially large numbers of these! ), a microwave oven, gasoline cans, bicycles, tires of all sizes, a couple of computer monitors (one smashed), a demolished air conditioner, a completely rusted hulk of a window fan, a smashed-up dinghy, plastic fishing line and net, a Christmas tree, and plywood. Those who were up for a party headed over to SBS where a barbeque was provided for all. The food was wonderful and there was plenty of it. Many people and businesses contributed to the success of the 19th annual Earth Day Beach Clean-up. We of course need to thank SBS for once again hosting the after event barbeque but our less obvious supporters also help to make this a successful community project. These include our major sponsors; the Martha’s Vineyard Savings Bank, Farm Neck Golf Club, Allied Waste Services and Riley’s Reads. Lastly, we need to thank the highway departments of the towns of Oak Bluffs, Edgartown and Tisbury for providing trucks and hauling away collected materials and the Martha’s Vineyard Refuse District for providing free disposal of beach debris. Thanks again and we hope to see all of you again next year!